Re: Captain Kagi-well maybe that is! I don't know how I missed the AT-AT guy, very cool, awsome blend of the 2 eras. The face looks slightly shiny though, but that may just be the pictutre. Kagi as really good looking too, your kamas are excelent, and they work well on shocks. Will you be making anymore of those Kamas? I probably could not afford any until next month, but would be interested. What is the hologram from? Thanks for the comments everyone. Incom- thats Hasbro's red believe it or not I didn't even reach forpaint on this guy. The red of the kama is not an exact match but its close enough for my needs. I think thatthe red of the kama and the red of the figure fight against each other a little but it aint bad. Straxus. I've sold through my first batch-thanks everyone! I'll be making more in the extremely near future. Perhaps we could make some sort of trade- your helmets for my kamas. PM me and we can got it going fa sho! UPDATE! I;ve repainted the holsters red which looks really awesome (well I think so anyway) I've also added a few small touches to his gear not overblown but I'll post some pics tonight. I realized what that particular gear strap was used for. I created a little comic to give an example. Great job matching the reds outrider. The Holsters look much better in that color. I like the gear strap too, although I suspect Kentucky Fried Ani dosen't . Straxus, Thats the best comic strip I've ever seen! Awesome. How long did it take you to create that? I never envisioned that gear strap for that purpose but from now on I'll never see it any other way! Great job and I'm honored that you'd take the time to create that- cool! Well the crude outline drawings, editing and cutting pasting images probably by themselves only took 10-15 minutes... The biggest time consumer was locating the appropriate toasted Ani and a suitable Palpatine image. I had fun making it. The scenario was first thing that popped into my mind for use of the gear strap...hehe. I kinda wanted to make comic-style replies to forums threads for a long time but never got arround to it until this one... I just had the sudden inspiration to do it...so I did. What did you use for the metal part of the gear strap? My sense of humor is very much along the same lines as yours. Its hilarious. Feel free to make as many comic strips regarding my customs as you see fit! Here's the second member of my ARC team thus far. You may remember my red ARC captain from about a month ago, well here's a standard blue version. I took a few liberties from the classic ARC of the Cartoons and other reference material. Hopefully you can understand what I was trying to achieve. My version is for rappelling into tight spaces and shocking would-be enemies by descending from out of gunships. I chose to sling his weapon so that he can hold onto rappel lines with both hands. I hope that you like it and please tell me what you think. I like it, the paint is a really cool color, and I like what you did to the helmet. The gun sling looks a little unweildy though, I think a holster would be easier. I also like the kama and the little touches you added to it. Nice Work! Hey OR! I never get tired of looking at your customs. U bring a freshness to the SW universe and your creativity is 2nd to none. Always look forward to seeing your creations. until next update..........................same time, same SW Channel. Here's something a little different from what I usually make. 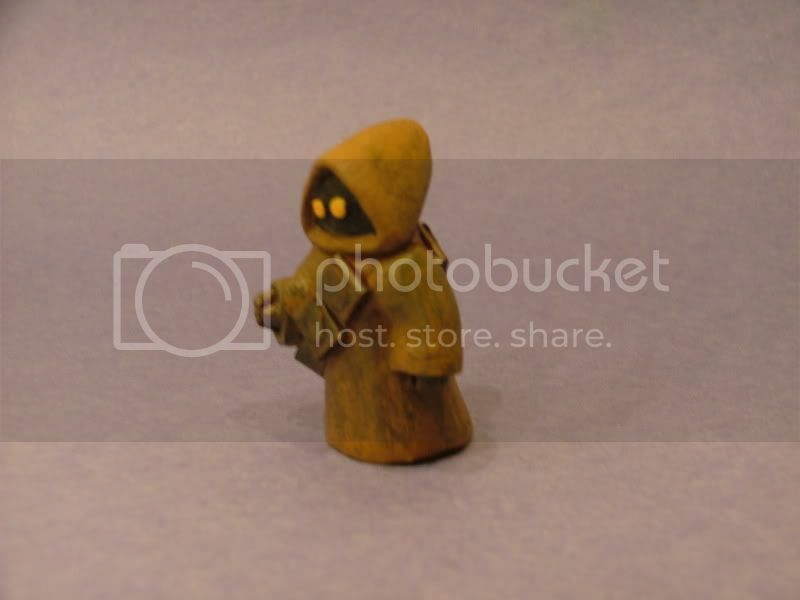 This is a 100% hand sculpted jawa figure as seen over at thejawa.com. I always loved their mascot- that cute little animated jawa seen on every page. 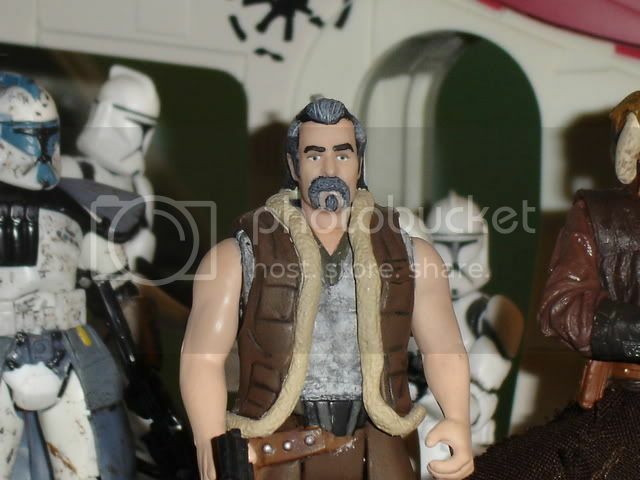 This figure hopefully captures that animated character. The belts and pouches are made from my usual concoction of belts items. Hope you like it. yep u deffinetly hit the mark (again) on this one. nice paint apps. The Jawa is awesome!! Good job!